The One Billion Steps for Health Challenge is open to everyone. World Walking allows you to use the distances you walk in the real world to complete imaginary (virtual) walks ranging from city tours to worldwide journeys. There are over 160 virtual walks to choose from. There are 20 Awards to unlock! The more you walk, the more you receive. Once you have registered or logged in using the landing page (use the Registration Section below the main image not the menu at the top of the page) all of the distances you subsequently add to World Walking will be included automatically to the live total displayed on the landing page of the miles walked by all the individuals and groups taking part in the Challenge. Use (spend) the distances you have banked to help complete your virtual walk. 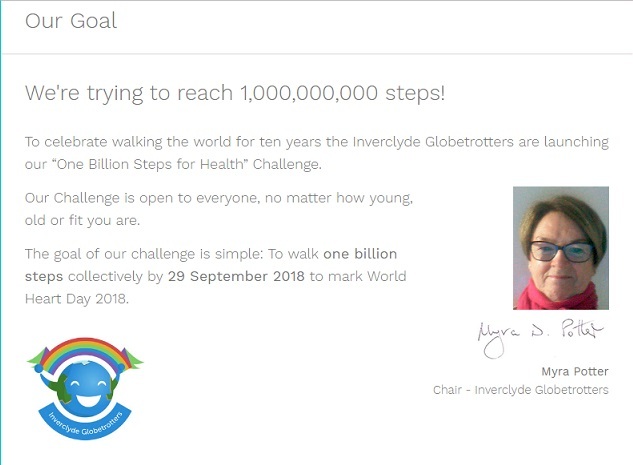 Apart from anything else, the landing page will let you see at a glance how many steps have been walked by everyone taking part in the Challenge. Once you have registered to take part in the Billion Steps for Health Challenge getting started is pretty straightforward. If you need help, have a look in the World Walking ‘Help’ section (there is a ‘Help’ tab at the bottom of each page on World Walking). If you don’t find what you need just click the ‘Get in touch’ button and we’ll get you sorted out. Step 1: Create a group for your service/team using the Quick Link on the landing page titled - "Create a group"
You can set up your group so that anyone can join it or so that people need to be invited to join. Step 2: Start a walk for you or your group using the Quick Link on the landing page titled - "Start a new walk"
World Walking allows users to enter an optional display name will be shown in place of their own name on the website. To start your group's chosen walk just click on 'My Walks'. You will see that your group has a walk available. You just need to click it to join. To help users enter their distance correctly they can set a default unit of distance. To do this click on 'settings' on the menu or your dashboard (your home page) and select the value you prefer to use when entering the distance you walk. What if you enter the wrong number of steps? You haven't spent the distance on a walk, or you have enough steps in your bank to delete the banked distance. The distance was manually added and not automatically pulled in through a wearable device e.g. your Fitbit. The distance was recently added (at most 1 month ago) and shows in the "Recent Activity" when you click the ‘Add Steps’ button. Many feet will make light work of one billion steps. Thanks you all for taking part. Let’s go for it!